Jawaharlal Nehru Agriculture University. Available vacancies are Field Extension Officer FEO, Assistant Quality Controller, Field Officer. Candidates who are looking for this Group 2 vacancies of MP Vyapam they can apply online for Professional Examination Board of MP official website @vyapam.nic.in. MP Vyapam Assistant Quality Controller, Field Extension Officer Jobs selection will be held through written test and interview. Online applications for this Group 2 jobs MP Vyapam Field Extension Officer and other posts is available from 14-12-2017 to 28-12-2017. Written Exam for MP Vyapam Group 2 jobs will be held on 27-01-2018 and 28-01-2018. 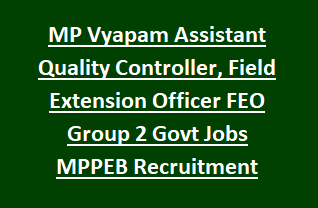 More details related to this MP Vyapam Asst Quality Controller, Field Officer vacancies exam pattern, age limits, application process and other details are given below. As on 01-01-2018 age limits for MP Vyapam is 18-40 years and for reserved candidates age limits are 18-45 years. There are total 249 MP Group 2 jobs in various government departments. Field Officer Jobs-Degree in Agriculture or Biology or its equivalent degree and Knowledge computer usage is required. Field Extension Officer Jobs-B.Sc (Agriculture/Horticulture/Forestry) or B.Tech Agriculture Engineering. Written exam will be held for 200 marks. Written exam consist of two different papers. Interested candidates may apply online for this MPPEB vacancies on or before 30-12-2017. Applications are accepted through MPPEB website only. Download Rulebook here for MP Vyapam Field Extension Officer vacancies.